Look up the word pink in the dictionary, and you’ll probably find a lot more definitions than you might have expected. As well as being the name of a pale red color, a pink can be a small flat-bottomed sailing vessel, a juvenile salmon, a chaffinch, a decorative hole or eyelet, a stab with a dagger, a foppish dandy, a tiny fragment, and (thanks to Chicago’s Pinkerton detective agency) a private eye. Besides that, as a verb pink can be used to mean “to narrow” (especially the eyes), “to wink or blink,” “to make a metallic rattling noise,” “to apply rouge,” and “to attach or cut a decorative trim” (which is why scissors with jagged blades are called pinking shears). But of all the word’s meanings, the oldest on record is one that appears in only the most comprehensive dictionaries: pink used to be yellow. Or rather, pink used to be the name of a murky yellow-green color—or, as the Oxford English Dictionary explains it: "A yellowish or greenish-yellow lake pigment made by combining a vegetable colouring matter with a white base, such as a metallic oxide." A “lake” pigment like this is an organic dye or artist’s pigment made insoluble by combining the organic material required with a metallic compound. (In this context, lake has nothing to do with bodies of water, but instead comes from lac, a dark red resinous substance produced by certain trees.) 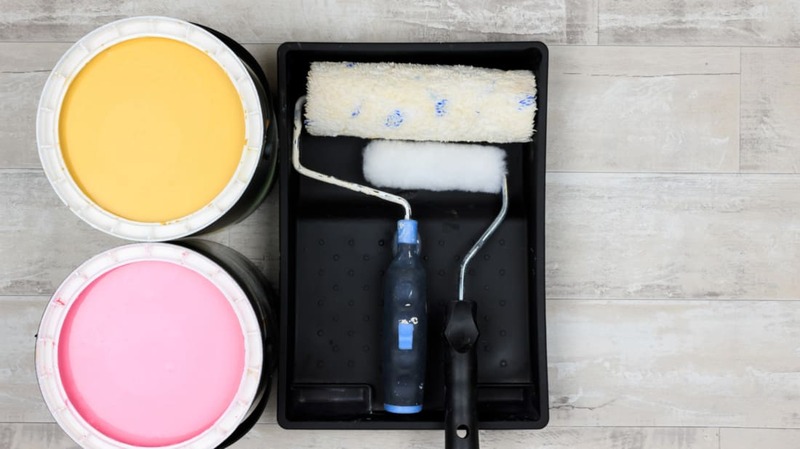 It just so happens that the pigment the name pink was originally attached to was made from vegetable matter that created a murky greenish-yellow tinge. In this sense, the word pink dates back to the early 1400s at least, and in fact, it wasn’t until the mid-17th century that pink came to refer to the pale reddish color it does today. But why the change in meaning? And why, for that matter, name either color pink at all? Admittedly, no one is entirely sure of the answer to either of those questions, but one very plausible theory is that the name pink (for obvious yellow-colored reasons) might have derived from an older German word, pinkeln, meaning “to urinate.” This earlier, murky-yellow version of pink has never actually disappeared from the language, and remains in place in various forms in the niche vocabularies of printers, designers, and artists and watercolorists especially. But the reddish version of pink has long since replaced it in everyday use—and the reason for that change might lie with one of the most famous figures from English history. The earliest likely record of the pale-red pink we know today comes from the English Restoration dramatist James Howard, who described a pair of pink gloves in the script to his comedy The English Monsieur in 1666. For Howard to use the word in this context so visibly, we can presume that the pale-red version of pink was already fairly well established in the language by then, suggesting that its origins likely lie in the early 17th century—and the final years of the reign of Queen Elizabeth I.
It’s believed that Elizabeth I was particularly fond of carnations, or “pinks,” a pale-red flower in the Dianthus genus probably named after its slightly notched or “pinked” petals. (Though now cultivated or dyed in many colors, carnations were originally pink.) Elizabeth’s fondness for the carnation—traditionally considered a symbol of chastity, marriage, and a love of God—helped make these flowers very popular in the late Tudor period, and carnations were grown and sold all across Elizabethan England for use in everything from perfume-making to flavoring wine. It’s presumed that it was this widespread popularity that helped to establish the flowers’ bright pink color with the name pink, and thereby forced the older yellow-colored version of the word to the etymological sidelines. Was Queen Elizabeth’s fondness for carnations really enough to permanently change the meaning of the word pink? It’s certainly possible—and it remains perhaps the most plausible explanation we have for one of the strangest changes in meaning in the dictionary.